LIRR service still suspended in both directions on Ronkonkoma, Oyster, Pt Jeff br. Utilize other branches: Montauk, Babylon & Hempstead. The 1:10AM train from Jamaica due Montauk at 3:57AM will not make a Hicksville stop today due to service changes at Hicksville. Limited alt service to/from Hicksville thru Ronkonkoma w/shuttle train operating btwn Hicks & Babylon, then transfer at Hicks to/from Ronk. 6:28AM Babylon due Penn 7:44AM operating 10 minutes late due to a high volume of customers traveling due to suspensions on other branches. The 10:37AM train from Ronkonkoma due Greenport at 12:02PM is operating 24 minutes late due to a late-arriving connection. Limited alternate service on Ronk, Pt Jeff. Train operates btw Penn/Babylon; shuttle btw Bab/Hvl. Trains operate btw Hvl/Ronk, Hvl/Pt Jeff. Limited bus service provided between New Hyde Park/Westbury. To avoid busing and delays, use the Montauk, Babylon and Hempstead branches. Extra LIRR Forest Hills stops added for Van Morrison concert today. You MUST be in first 4 cars to exit LIRR train. The 12:42PM from Port Washington due Penn 1:27PM canceled due to equipment trouble. Take the 1:11PM from Port Washington due Penn at 1:56PM. The 4:24PM train from Long Beach due Penn at 5:21PM is being delayed at Laurelton due to equipment trouble. The 5:25PM train from Penn due Babylon at 6:43PM is operating 10 minutes late due to congestion on the branch. Rnknkma E/B trains btwn 5AM-9:15AM - canceled. No bus/shuttle srvc. Use alt branches such as Bbyln or Mntk. Pt Jeff E/B srvc also suspended. The 1:47AM train from Jamaica due Oyster Bay at 2:42AM is canceled today. Customers are being accommodated by bus service. 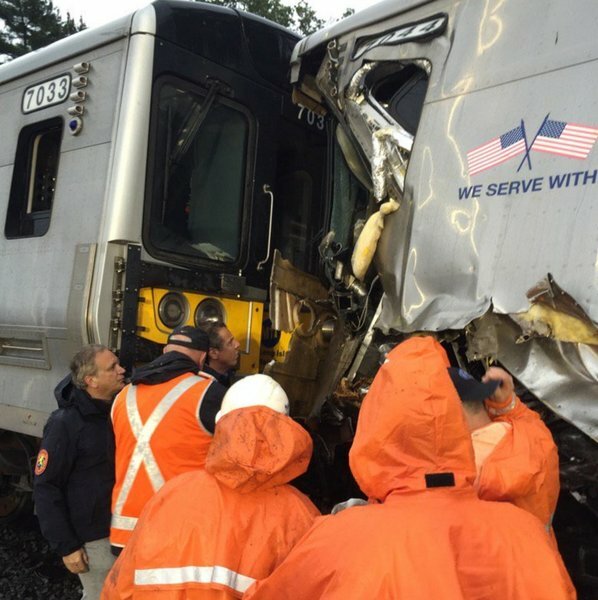 Limited w/b Pt Jeff, Ronkonkoma & Oyster Bay srvc restored. 14 AM Rush trains canceled. Anticipate 20-30 min delays & consider alt branches. 4:06A Ronkonkoma due Penn 5:29A is operating 11 minutes late due to congestion caused by an earlier train derailment east of New Hyde Park. The 5:59AM train from Port Jefferson due Long Island City at 7:51AM is being held prior to departure due to late-arriving equipment. 7:18AM from Westbury due Penn 8:02AM-canceled. 7:26AM from Westbury due Penn 8:06AM adds Carle Place, Mineola, Merillon Ave, NHP&Jamaica. 7:28 train from CSH due Penn 8:25-canceled. 7:37 from CSH due HPA 8:30 adds a stop at Hicksville. Transfer at Jamaica for service to Penn. The 7:19AM train from Ronkonkoma due Penn 8:28AM-canceled. Customers accommodated by the 7:32AM train from Ronkonkoma due Penn 8:47AM. 7:58 from Bethpage due Penn at 8:53-canceled. Customers accommodated by 8:12 from Bethpage due Atl Term 9:01. Xsfer in Jamaica for Penn.